>> Is the 1926/27 T a T-Bucket? Let’s settle that and cover a few more things. From time to time, I hear people say “You can’t really call a 1926/27 T a T-Bucket.” But I say you can. And here’s why. Or someone else will be admiring Charles and Lavelle Tunnell’s 1927 T and mention that it’s a really sweet T roadster, but not one of those T-Buckets. Hey, I’ll do it myself sometimes because I might think the T owner would feel I wasn’t giving the car proper respect calling it a T-Bucket. T roadster, modified, lakes modified are all proper terms when referring to a particular type of 1926/27 T roadster. And so is T-Bucket. Here’s why. Let’s start with some fun Model T and T-Bucket hot rod history. More specifically, T-Bucket refers to the passenger compartment of a Model T runabout body, which does look somewhat like a big bucket when viewed by itself. Once it’s built up as a hot rod it doesn’t make any difference whether it has a turtle deck, pickup bed or nothing else behind the “bucket” it’s known as a T-Bucket. While I don’t know when the term T-Bucket originated its use became much more popular after Norm Grabowski’s radical T roadster appeared in LIFE magazine in 1957, and a year later on the television series 77 Sunset Strip. It’s ironic that what’s undoubtedly the most widely known T-Bucket really isn’t based on a Model T runabout. Say what? Young Norm Grabowski in his 1922 T roadster. 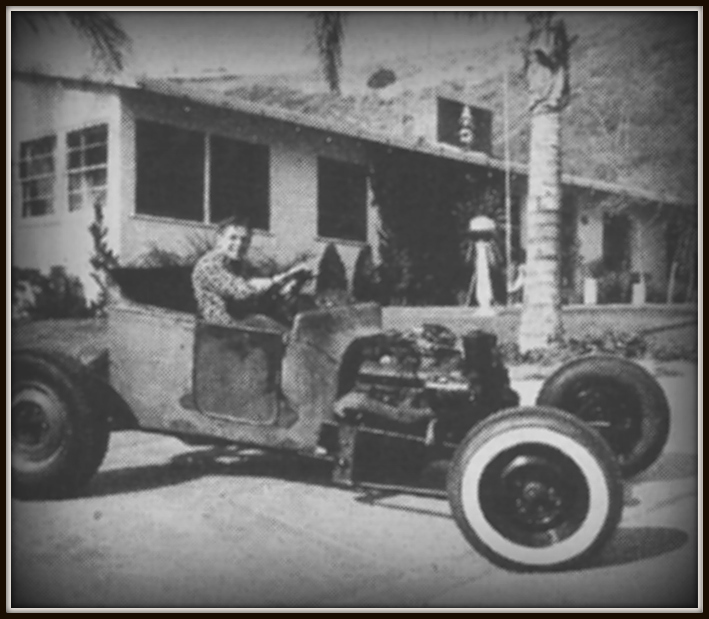 In 1952 when Norm Grabowski set out to build a hot rod he bought a Model A for $100, kept the chassis and ditched the Model A body in favor of a smaller, lighter Model T body. But availability and budget didn’t match up in terms of a desired Model T runabout body. Instead, some creativity was applied to the more mundane Model T touring car. What Norm used for his T-Bucket was just the forward portion of the touring body, with the rear passenger section left for the scrap pile. The photo above shows what Norm basically used for his body. The telltale sign of the use of a shortened 1922 Model T touring body as a replacement for a runabout is the horizontal body reveal line that runs straight to the rear of the body rather than sweeping up with the back as on a runabout. Shown by the yellow arrow above. In 1956 Tommy Ivo would also have to resort to a 1925 Model T touring body rescued from the desert to build his legendary T-Bucket. Note the horizontal reveal above the yellow arrow. The two most famous T-Buckets of all time were not built using the Model T runabout body that is considered by most as the standard for a T-Bucket. Over 60 years ago, even in the semi-arid to desert climate of Southern California, which tends to preserve automotive sheet metal many decades longer than in the Midwest and Northeast, it was extremely hard to find a usable Model T runabout body. And those Model T’s were just a bit over 30 years old at the time. After understanding what makes the 1915 to 1925 Model T runabout and shortened touring a T-Bucket body, let’s look at the 1926/27 T.
The runabout body was still being offered in the Model T line after its first big body style change since 1915. Ken observers will note the new model is $5 cheaper than the 1924 model. My one man’s opinion on why many are reluctant to refer to 1926/27 T’s as T-Buckets is because since the 1960s most all of the fiberglass 1926/27 T roadster bodies have been produced as a one-piece unit, with the turtle deck integral to the body. However, that was done more as a convenience and from an aesthetic standpoint by people like Curt Hamilton and Bud Lang at Cal Automotive. As the image above notes, the turtle deck is a separate component on the 1926/27 Model T’s just as it was on the 1915-1925 Model T runabouts. You don’t see them very often by themselves, but the photo above shows a turtle deck for a 1926/27 T runabout. In fact, in 1926 Ford offered the runabout roadster with a 56-inch long pickup bed in place of the turtle deck. It’s interesting to note that Charles Tunnell’s T roadster shown as the second picture in this story started out as a 1927 runabout bucket with an abbreviated pickup bed. Only much later was the bed replaced with a turtle deck. Over the years, just a few companies offered the 1926/27 T-Bucket body by itself. From a practical standpoint, they’re a tad roomier than a ’23 T-Bucket body. But from the standpoint of looks they’re pretty boxy looking and the cowl looks kind of crude compared to the nicely tapered cowls of 1915-23 T-Bucket bodies. That’s why I don’t believe they’ve been very popular in the fiberglass body world. So now you know that whether it’s a 1915, 1923 or 1926 T roadster you can call it a T-Bucket without hesitation. But, hey, it’s just a label and this is a sport open to creativity and an “anything goes” attitude. The point being, you can call them whatever you feel comfortable calling them as long as you’re encouraging and supporting the T-Bucket hobby.